WellnessLiving, a business management software provider for the music school industry, will be attending the annual Summer NAMM music trade show. Music schools owners will have the opportunity view a live demo with WellnessLiving representatives at booth #702 to learn about how WellnessLiving can help improve their business. Everyone who visits their booth will receive 50% off their Professional Plan. WellnessLiving’s built-in features have helped hundreds of music schools succeed. Integrated marketing tools easily boost online presence and attract new students. Retention rates skyrocket by keeping students engaged with automatic emails, text campaigns, and push notifications. Go mobile with the Achieve Client App and Elevate Staff App, free to download in the App Store and Google Play. Book or cancel classes and appointments, access the point-of-sale, sign waivers and contracts on the spot, and more, right from your phone. WellnessLiving is an all-in-one business management software provider for the music school industry. 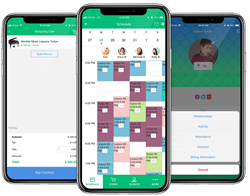 Their cloud-based software features real-time appointment and class scheduling, merchant processing, payroll, email and SMS marketing, client review management, rewards program, a mobile client app, and now a mobile staff app. WellnessLiving currently supports thousands of local businesses with over 4.7 million end-users. Their mission is to provide the wellness industry with the most comprehensive toolset available to better manage their existing clients while helping them grow their business.